But when the truncated 19th amendment was passed, Mr. Wickremesinghe was not a happy man. In his address to the parliament he said that the new 19th amendment was a temporary measure and that a new constitution which abolished the Presidency would be brought soon enough. 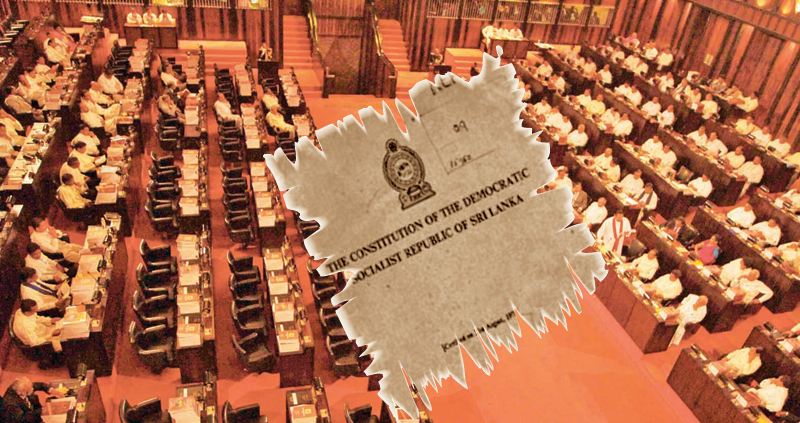 Now Mr. Wickremesinghe wishes to act as if this has already been done and that we live in a new Constitutional system, in which the Presidency has not merely been reformed and partially restricted, but has actually been turned into a lame duck while the parliament has been exalted into the centre of the political system, which is only nominally presidential. All this simply because of a case of sour grapes on his part, because he ran for the president twice and failed, and knows that if there is another such election, he may have to vacate in favour of a more popular personality. Mr. Wickremesinghe’s peeve against the Presidency was manifested as far back as 2001-2003, when President Kumaratunga complained on the record to the foreign press, that he ignored and bypassed her at first and then tried to usurp her powers-- and therefore she was constrained to kick him out. The 19th amendment was not an alternative Constitution or even a mini-Constitution! It cannot change an existing Constitution into a new one. It cannot change the pre-eminent institution, whose pre-eminence derives legitimacy from popular sovereignty, as the sole institution directly elected by the people taken as a whole, into an institution that is co-equal to or even subordinate to the legislature composed of the political parties. The whole logic of the French Presidential republic is the combination of the republican character and the Presidential character. At the root is popular sovereignty and popular sovereignty is primarily represented not through Parliament but through the directly elected Presidency, because The People considered as one, as a whole, a totality, superseded the arithmetical addition of the people broken up into localities and political parties. It is only the directly elected Presidency that is representative of the people taken as a single entity. The Parliament is a kaleidoscope of shifting coalitions elected as and from a patchwork of localities. The President is elected by the island taken as one unit, a single entity. That is also precisely why the President is our leader; not the Parliament; and the directly elected Presidency is the apex of our state form, our state system and structure—not the parliament. The 19th amendment modified the architecture of one corner of our state system. It did not, could not, abolish, reverse or invert it.